June has flown by, and July is already in full swing. My writing life takes a bit of a back seat, or at least a side seat, during the busiest part of the season for Serenity Hilltop Retreat. It does grate on me to do laundry instead of writing. I can fold a mean fitted sheet in a minute flat! But it’s not the same as hours spent writing and editing. Nothing is. This too shall pass, as they say. And it’s the guest house income that allows me hours and hours of writing time in the winter and spring, so I can’t fuss too much. I did meet my writing goals for June. Yay! And I’m on track for July. Doing the math, I need to have a solid first draft of Slinky Steps Out by the end of August so it has time to rest some before editing and revisions. That means it takes priority over The Brave, Frail, and Delicate Princess at the moment. Everything in its own time. I also have a picture book, Too Hot For Socks, out to an agent I know. Tick. Tick. Tick. Hoping to hear back by August. Editing work with Pen-L goes forward as well. I have worked on 13 books for them since December, and another is waiting in my inbox to begin. I’m also tidying up some of the final, formatted versions of those earlier books. It’s amazing what gets past me or the issues that the formatting process creates. Check, Check, and Double Check! I must admit, there is a pure delight that comes from seeing these books formatted, appreciating the cover and what Pen-L comes up with, and then holding the final creation in my hand. Only the author him or herself can be happier. I love books! 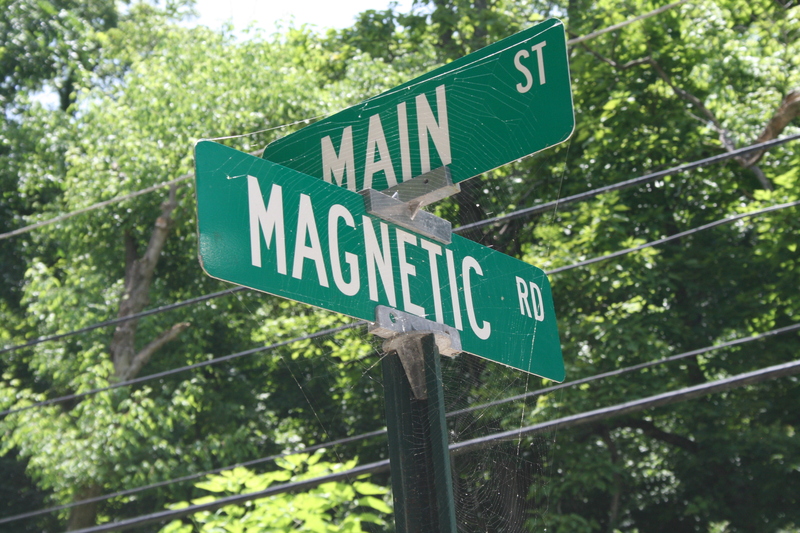 But the most exciting is that at any moment the first round of edits and the cover proof for At the Corner of Magnetic and Main will arrive in my email box. 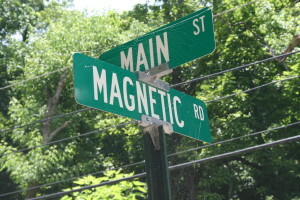 Street sign at the real corner of Magnetic and Main here in Eureka Springs. Can you see the spider web? Ooo. Nice effect. Patience is VERY hard to muster! I’ve never really been on the other side of the editing process. Not like this. With my books so far, the final decisions on anything fell to me. I could ignore and accept changes as I saw fit. What will Duke and whomever else is involved want me to change? (nail biting ensues!) More on that ahead, you can be sure. I have a page devoted to this new book here at my website. Check it out! It is due out in August. 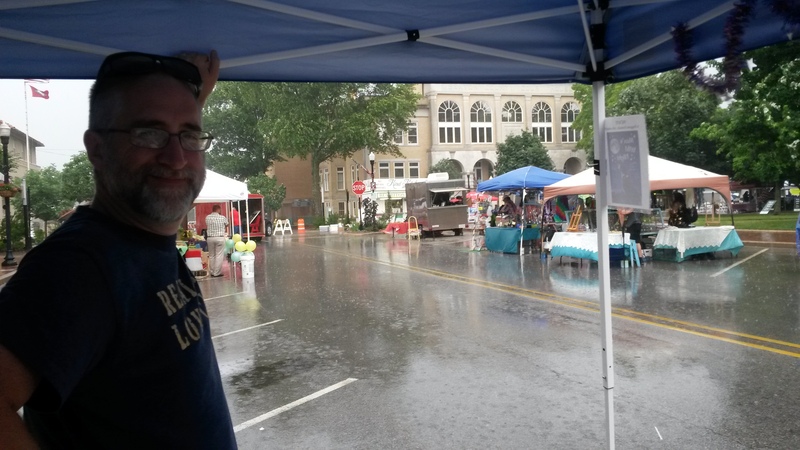 We tried out a new event this month: the First Friday in Bentonville, Arkansas, on the square downtown. 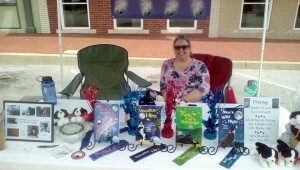 My booth at the July First Friday in Bentonville on the square. This truck was across from me all day. Not fair! 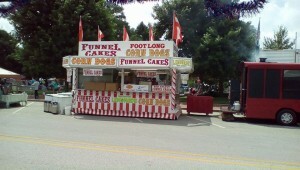 I managed to resist, mainly because it was too dang hot to have genuine interest in something fried. The BBQ truck next to it blew smoke on us all day. That made it less appetizing as well, though Scott was pretty determined that he would want some for dinner. He didn’t. It was fun, but we quickly learned that no one even really shows up until about 4:00 pm. We were set up by 10:45 am for the supposed 11:30 am start time. ZZZzzz. That made for a really long day. And about 3:00, this happened. And happened. It just poured for about 30 minutes. The tent didn’t suffice. We had to hide everything in the storage tubs. Several vendors just left. 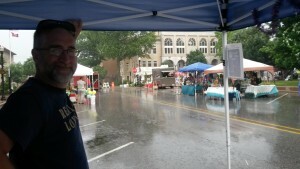 The rain did stop, and people did show up eventually. The live music on the corner was loud and jazzy. We sold some books. Mostly Max’s Wild Night. It has been a big hit. Here’s a link to a great new review from The Styling Librarian. Book 4 in the Cats in the Mirror series is still up next for the spring of 2016, but I may have to put Dottie’s Daring Day in for 2017 instead of Kimba’s Christmas. The dog book thing is hot! 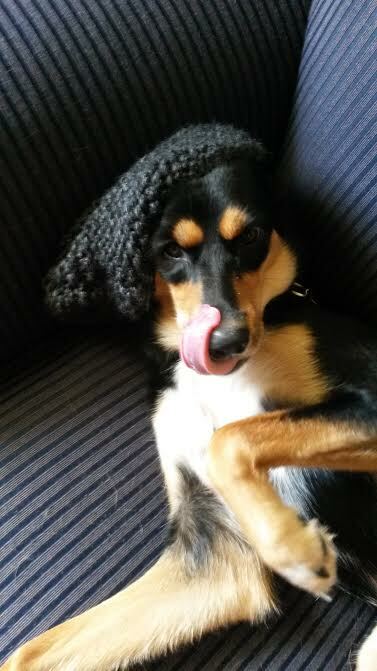 Dottie, showing off Mindy’s first knitting project. She thinks moving her book up in the line up is a tasty idea. I was hoping to do the First Friday event in October as well — the only other one that works with our schedule — but I’m not sure it was worth it. At a booth fee of $75, we have to sell a lot to break even. I did meet two teachers in the area who seemed interested in having me come speak at their school. That connection would make it totally worth it. But it’s not the first time I’ve had that kind of conversation come to nothing. We shall see. I hope you have enjoyed some of the author interviews I have been posting. It helps to fill the weeks I just can’t stop and create a blog post. Writing on my books always wins the day when time is short. Up next, I’ll be interviewing Anita Paddock about her new true crime novel, Blind Rage. I was in on the proofing of this book, and it’s really a fascinating story of what can lead a potentially normal person down the road of, well…blind rage and murder. I think this was the first true crime book I ever read. That’s not normally my thing. But this one is really good. Look for Anita here in a weeks or so. Stay cool in this crazy summer heat. It’s about the only time I regret living on the top of a mountain, but the breeze can be amazing. This entry was posted in Latest News and tagged Anita Paddock, At The Corner of Magnetic and Main, Blind Rage, Dottie's Daring Day, Eureka Springs, First Friday Bentonville, Kimba's Christmas, Max's Wild Night, Slinky Steps Out, The Styling Librarian on July 7, 2015 by MegDendler.